Creative launched its Zen Vision range of portable media players earlier this year and gave the all-conquering iPod a real run for its money. 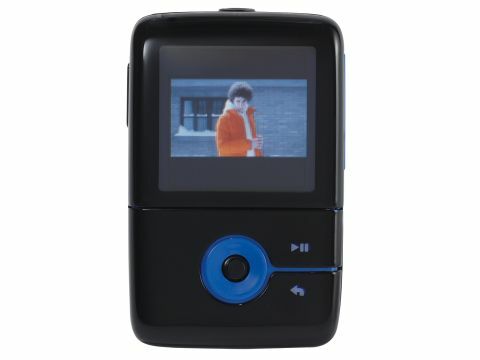 The Zen V Plus is the mini-me version and is available with 1GB (reviewed here), 2GB (£110) or 4GB (£150) of memory. This is certainly the funkiest player in the group test, sporting a luminous orange and glossy black colour scheme (it's also available in green, blue and white) and an unusual, but very effective, button layout. In the centre of the device is a joystick that doubles as the enter key, while the volume and record keys are located down the side. The 4:3, 1.5in screen with its128x128-pixel resolution, is of the OLED variety, so it doesn't need a backlight and thus operates for longer. Along the top are the headphone socket, a USB 2.0 port and a line input, which lets you record audio from an external CD player or another source thanks to the built-in WMA encoder. Aside from the bread and butter functions such as MP3 and WMA playback, there are a few other nifty features. It acts like a mini personal organiser, with an alarm clock and calendar, plus you can view tasks and contacts. You'll also find an FM radio tuner and a handy voice recorder on board, plus the unit offers PlaysForSure support for purchased or subscribed to music. Music, video and photos can be transferred to the player using the drag and drop method, or by synchronising with Windows Media Player or Creative's superb supplied software, Media Explorer. Video files have to be converted into a format the unit can understand, but the conversion process is very quick. The unit is extremely easy to use: the little joystick is easy to access and the onscreen menus are very responsive to its commands. The entire user interface is superb in its simplicity and is very intuitive to use. When playing back video files, the Zen V Plus delivers an excellent picture. We converted and tried a range of file types (including WMV, DiVX, XViD, MPEG1 and MPEG2) and the player was happy with all of them. The OLED screen produces sharper images than the Maxfield and Ulysses players - small text is legible and you can make out plenty of detail. Colours are also strong, and there's the unusual option of choosing which way round the video is displayed on the screen. On the downside, movement is a little jerky and, due to the low frame rate used, there were the occasional lip sync errors. The visible pixel structure also made edges look a little jagged. We weren't expecting videophile quality, though, and generally it's ideal for watching TV on the train. Sound quality is similarly superb. MP3s encoded at 192kbps sound crisp and clean, with a foot-tapping bass. Sound recorded from an external source is also excellent, and there are no problems with FM radio reception or sonics. With photos, the Zen puts on another terrific show. The screen uses its 16,384 pixels to the full, making digital snaps look cleaner, sharper and more vibrant than its rivals, and you can view them as a slideshow or by zooming in.